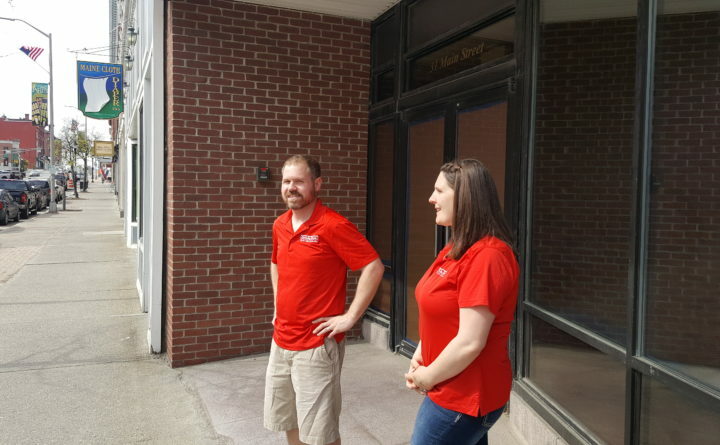 Wade (left) and Eliza Butler, owners of Specialty Sweets, stand outside 31 Main St. in downtown Bangor, May 13, 2106. The owners of Bangor confectionary Specialty Sweets announced Monday they will close their downtown location later this month, after two-and-half years in business. Eliza and Wade Butler said that Jan. 19 will be the last day open for the downtown candy and ice cream shop, located at 31 Main St. All retail operations will move to their flagship store, located at 36 Springer Drive, off Hogan Road next to the Christmas Tree Shops’ location. The Butlers will retain the upstairs events space downtown, which they rent out for small events. The Butlers said on Facebook that the closure of the downtown shop was necessary for the business overall. “We have really put a lot of thought into this decision and it is just right for our family, our employees and the overall health of our business,” Eliza Butler said. Specialty Sweets Downtown sold handmade chocolates, candy, ice cream, fudge, hot chocolate, gourmet popcorn and other sweet treats. Specialty Sweets makes all of its products at its much larger Springer Drive store, which has been open since 2014. Specialty Sweets was originally known as Sanborn’s Fine Candies, which opened in the 1980s at 849 Stillwater Ave. The 1851 building that housed Specialty Sweets Downtown was purchased in March 2016 by Telford Allen III, who also owns the Circular Block building on Broad Street, and was redeveloped over the course of that year into two high-end 1,400-square-foot apartments, a second-floor events space, and the first-floor retail space that Specialty Sweets has occupied since 2016. Over the years, the building has housed downtown businesses including The Fashion, a women’s clothing store that opened in 1893 and was operational until at least the 1930s; the original 1970s location of Knapp’s Book and Music Store, before Knapp’s relocated to its current location at 51 Main St.; Maine Times Magazine in the 1990s and early 2000s; and, more recently, Maine Asset Management.